By Scott Gilfoid: Ricky Hatton (45-2, 32 KO’s) will be taking a major risk in his first comeback fight by taking on the tough as nails Michael Katsidis (28-6, 23 KO’s) rather than an easy stiff, which is what Hatton probably should be fighting. The Dailystar is reporting that the 32-year-old Katsidis will be Hatton’s next opponent on November 24th at the Manchester Arena (formerly M.E.N Arena), Manchester, Lancashire, UK. Hatton will probably have a significant weight advantage over Katsidis for this fight. Katsidis proved recently that he’s too small to fight at light welterweight, and you got to figure that Hatton will be fighting Katsidis at 147. In other words, Katsidis could end up moving up two entire weight divisions to take the fight. Maybe with that kind of advantage Hatton can win. I think Hatton is making a huge mistake if he fights Katsidis. It’s a brave move but stupid as heck to fight this guy. I guess it’s good in a way, though. At least when Hatton gets whipped by Katsidis, he can immediately go back into retirement and not waste time getting his hopes up about bigger fights agaisnt the likes of Floyd Mayweather Jr., Amir Khan and Kell Brook. 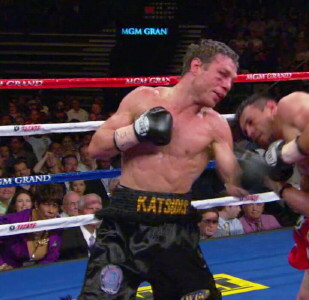 Katsidis will take those dreams away by thrashing Hatton by blasting him out. I’m surprised Hatton is going to fight Katsidis, because with the way Hatton was hurt by Juan Lazcano, Mayweather and Manny Pacquiao, he should be staying far away from a puncher like Katsidis. He’s too advanced for a fighter that has been living the high life for the last three years eating rich food and drinking good drink. Hatton should be starting off easy and then working his way up to the likes of Katsidis in say a year or so. Katsidis has lost four out of his last five fights but you can really call it three out of his five fights, because I had Katsidis beating Ricky Burns last November. Katsidis told The Sun that he was only at 30 percent for that fight and I believe him. He did a great job against Burns for someone only 30 percent. Katsidis’ other recent losses have come against Juan Manuel Marquez, Robert Guerrero and Albert Mensah. The defeat Mensah was after Katsidis made an ill advised move up to light welterweight to fight a 5’10” in Mensah who was just so much bigger than him. Still, I thought Katsidis fought well enough to deserve a draw in the Mensah fight. But Katsidis definitely lost to both Guerrero and Marquez. Those were one-sided fights from start to finish.